Monsters, Inc came out in 2001 and I remember buying the VHS for Olivia who at the time was three years old. We watched it back then and she really enjoyed it. 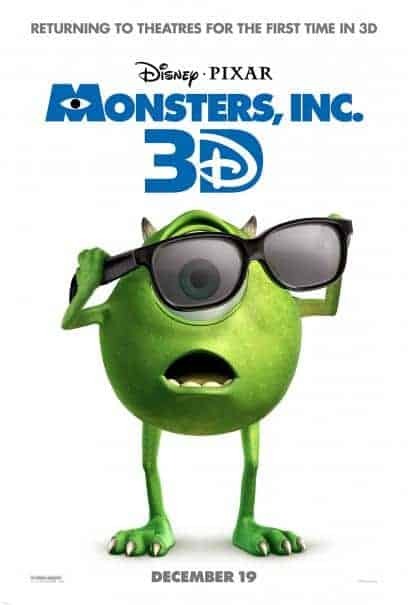 Fast forward to 2012 where Monsters, Inc. is being re-released…this time in 3D! Monsters, Inc. is such a cute family movie with a great story. It’s set in Monstroplis,a company town full of monsters of all shapes and sizes. Sulley (John Goodman) and Mike Wazowski (Billy Crystal) work at the local factory where the mission is who can scare the children of Earth the most. It’s important that the monsters be good at their jobs since Monstropolis depends on the screams of the children for their power source. However, children are considered especially toxic and if one accidentally enters Monstropolis, then it’s a real emergency. Think hazmat teams and the works! One night a little girl named Boo follows Sully back to Monstropolis. When Sulley realizes this, he freaks out. His job would be in jeopardy if anyone found out so he has to hide Boo and figure out a way to get her back home. My favourite thing about the movie was watching the bond between Sulley and Boo grow stronger. At first, Boo terrified him, but he grew more attached and protective of her as the movie goes on. It was really cute seeing this big monster interacting with a tiny little girl who doesn’t really talk yet. The movie is also really funny! I think both adults and children will enjoy the humour. I mean with Billy Crystal involved you know it has to have some good laughs right? Watching it in 3D was something else! The animation is incredible and with the fact that it was in 3D made me feel like I was enveloped in the world of Monstropolis too. Monsters, Inc. hits theatres for the very first time in 3D on December 19th. It’s a movie worth bringing your whole family too even if you have already seen it. The experience in 3D just amplifies everything I loved the first time around. My granddaughters, Hannah and Emily, really liked this when they were younger. Now, I think my granddaughter Emily would enjoy it. Can’t wait for this, one of my faves!! I have seen clips of this and it is a must see for the family and kids will LOVE it! I adored this movie and my boys still love it. It might be our Christmas movie this year – and the 3D should make it pretty awesome, too. I’m stopping by to say Welcome! to the Biannual Blogathon Bash ( http://www.biannualblogathonbash.com/the-blogathon/sign-up/ ) . We’re looking forward to you being there in January and I’m sure you’re looking forward to getting lots done, too! I love that movie! I’ll definitely have to go see it in 3D! I definitely loved the original and very excited to see how it’ll be in 3D! Sully and the sock – favorite giggle! This is going to be great in 3-D! This is one of my favorite Disney/Pixar movies! Loved the first one, can’t wait to see this! Neither of my kids, 4 years old and 20 months, have seen this. I think it’s time! !